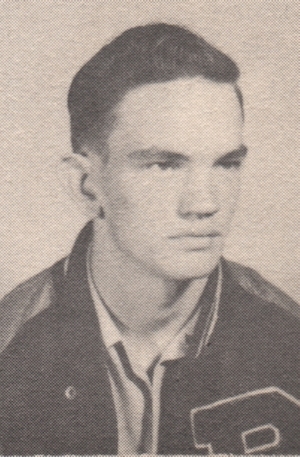 Obituary – Miller, Thomas Dawayne « Perry High School Alumni Association, Inc.
Football 48-51, Basketball 48-51, Basketball Captain 50-51, Baseball 48-50, Student Council 49-50. ﻿Last rites for Cpl. Dawayne Miller, 19, Korean war hero, will be at 2 p.m. Monday in the First Christian church of Perry, with a military burial to be in the Garber cemetery. Cpl. Miller’s body will arrive here at 2:20 p.m Friday and arrangements will be under direction of the Newton funeral home. Services here will be in charge of Rev. Cryder Brayshaw, Perry Christian church minister, and Rev. Ivan Hansen of Garber. The Marine corps will have charge of burial at Garber. Cpl. Miller, first Perry man killed in Korea, died in action Oct. 5. He had been in Korea 11 months with the First Marine division. He enlisted in the Marines in April 1951, grid trained at San Diego, Calif.
A 1951 graduate of Perry high school, he was active in PHS sports. He was captain of the Maroon basketball team in his senior year. A member of the Garber Christian church, Miller was born in Morris, Okla., Feb. 17, 1933. He lived in Morris, Oklahoma City and Garber, where his father was employed in oil field work. His mother died there in 1945, after which he and his brother, Donnie, moved to Perry to make their home with their grandmother, Mrs. R. E. Brown, 825 Kaw street. 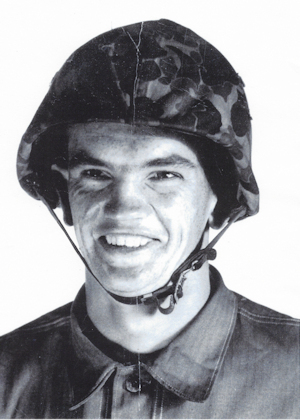 He is also survived by his father, C. L. Miller of Ventura, Calif.
Corporal Miller was a member of Battery D, 2nd Battalion, 11th Marines, 1st Marine Division. He was Killed in Action while fighting the enemy in Korea on October 5, 1952. Corporal Miller was awarded the Purple Heart, the Combat Action Ribbon, the Korean Service Medal, the United Nations Service Medal, the National Defense Service Medal, the Korean Presidential Unit Citation and the Republic of Korea War Service Medal.